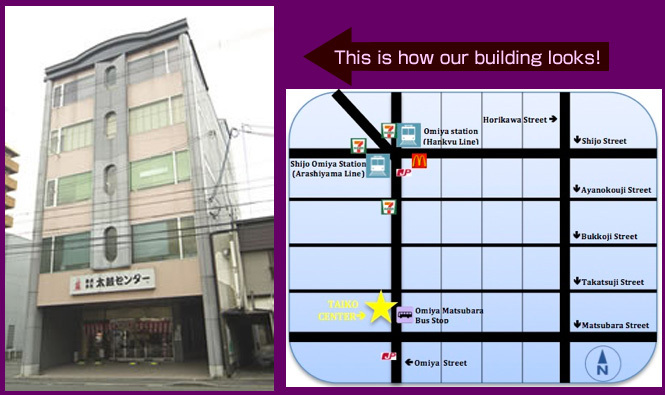 Take Hankyu Line to Omiya Station which is the closest station to our studio. 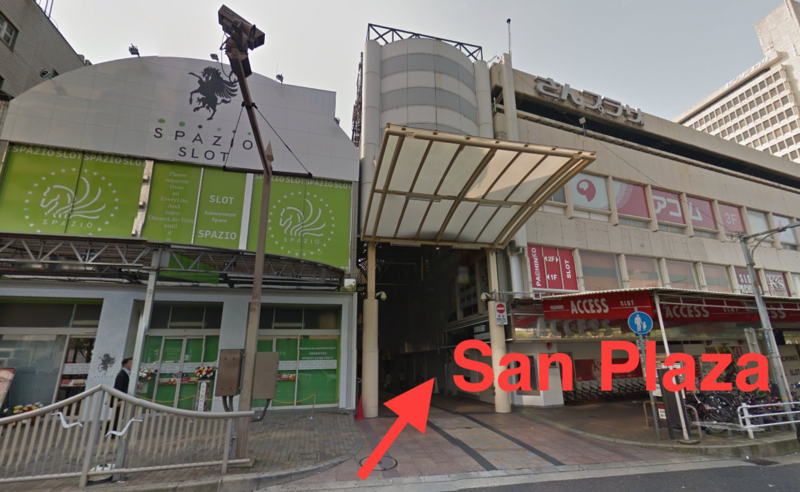 Walk south for 7-8 minutes on Omiya Street and you will see it on your right. #207, #206 or #71 will stop right in front of our building. The bus stop is called Omiya Matsubara. Most tourists of Kyoto take bus and train, which are very convenient. We recommend a website called Bus and train Veteran Arukumachi KYOTO Route Planner. You can learn how to use these transportation system (ex. you can learn about fare, how to pay, and types of bus. Also, you can check bus time table and bus stop information. Bus route map is very usuful. train - Take Karasuma Line to Shijo Station, and without leaving the underground go to Karasuma Station (they are connected). From Karasuma Station, take Hankyu Line to Omiya Station. Walk south for 7-8 minutes on Omiya Street and you will see it on your right. Foot - Walk out of North exit (the side with Kyoto Tower), and turn left on the Shiokoji Street. In few minutes you will see a major road called Horikawa Street. 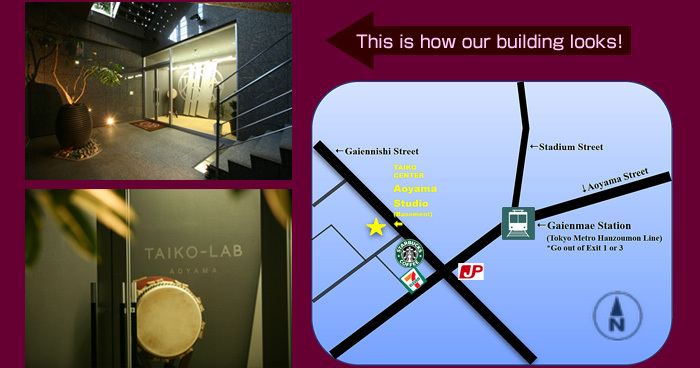 Turn right (towards north) on Horikawa Street and stay on it for 20 minutes until you hit Gojo Street. Turn left on Gojo Street and soon turn right on Omiya Street. Just in few minutes after you pass your first light, you should see our building on your left. 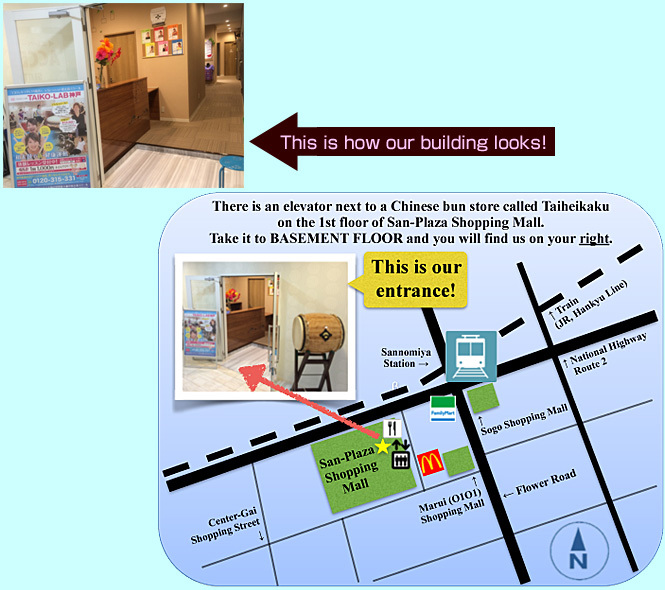 It has our map, address, contact information, picture of the building and other details. 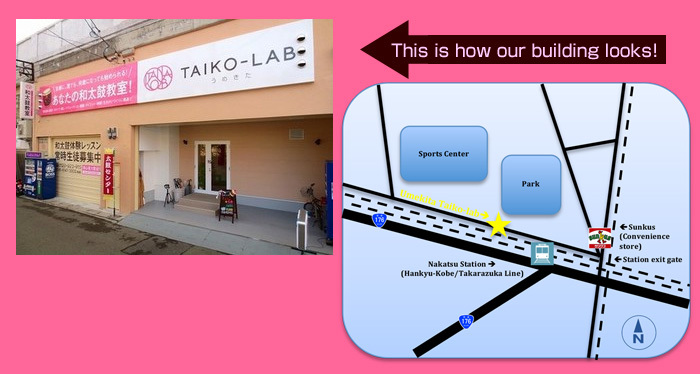 It may be helpful for you to have if you are walking to get to our class. Take Hankyu Kyoto/Kobe/Takarazuka Line to Hankyu Nakatsu Station which is right next to Umekita studio. Walk out of the only station exit and go down the stairs. Immediately turn left and you will see a convenience store in front of you and a park on your left. Walk towards the park and you will see the studio on the left side of the street. 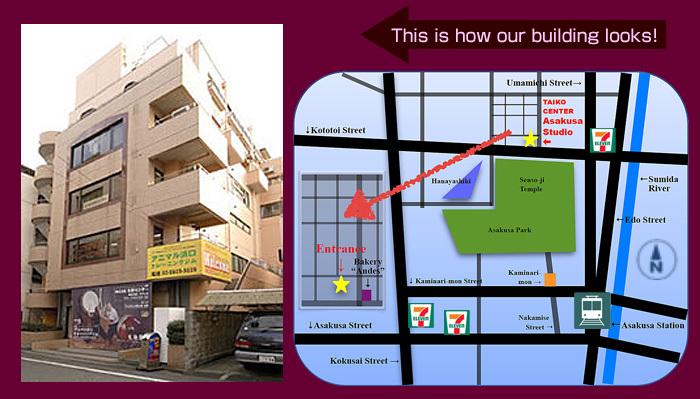 *You can also walk for 10 minutes from Subway Nakatsu Station (Midosuji Line), but Hankyu Nakatsu Station is closer. train - Walk to Umeda station from Osaka station. (They are connected.) Take Hankyu Kyoto/Kobe/Takarazuka Line to Hankyu Nakatsu Station. *It is very confusing to find us if you are underground, so follow this direction! 1. Please get out of the station from any SOUTH-WEST exit and get to the national highway route 2. 4. 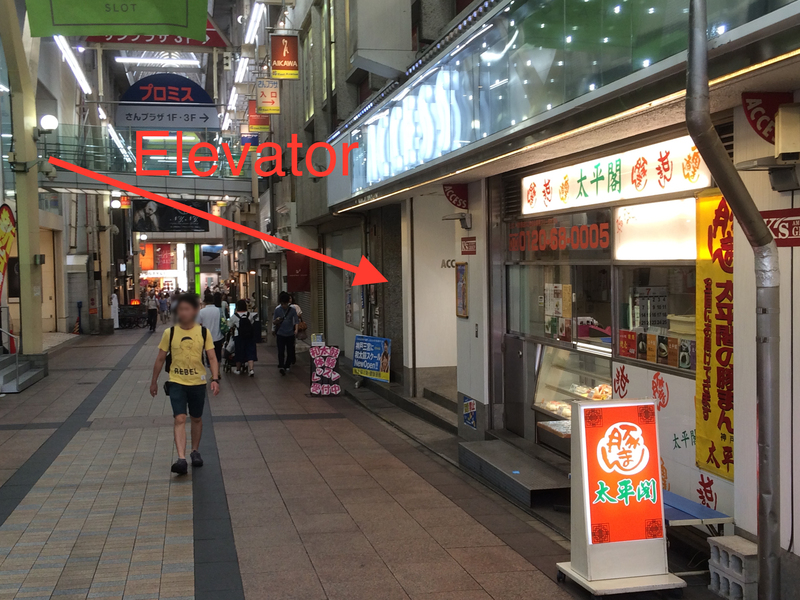 On the left of the bun store is an elevator that will take you right to our studio. Take it down to the basement floor, and you will find us on your right. Take Toei Asakusa Line to Tokyo Metro Ginza Line to Asakusa Station which is the closest station to our studio. ally at the first light, and turn left right away. The second building on your right is the studio on the 3rd floor. Street for 3 minutes and turn right on Gaiennichi Street and you will see a Starbucks. In a minute you will see it on the left. The studio is in basement floor.